North Carolina tracks point source "stack" emissions through its emission inventory program for facilities required to have an air permit. Large (Title V) facilities are required to file certified reports annually and these data reports are reviewed by DAQ staff. Small point source facility (facilities classified as Small or Synthetic Minor) are also inventoried. The Title V facilities account for the vast majority of the emissions of most pollutants on a statewide scale. 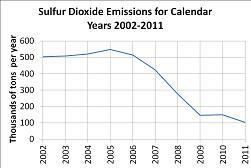 The plots below show emission trends for two criteria air pollutants from calendar year 2002 through 2011. Each calendar years data includes all the permitted facilities that operated for any length of time in that calendar year. 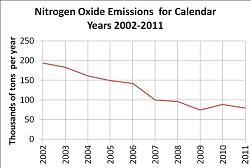 Since small and synthetic minor facilities only report upon air permit renewal, the most recent emission inventory data was used for the years when no data was reported. National-Scale Air Toxics Assessment (NATA) is a screening assessment that estimates inhalation health risk for cancer and non-cancer health effects for North Carolina.